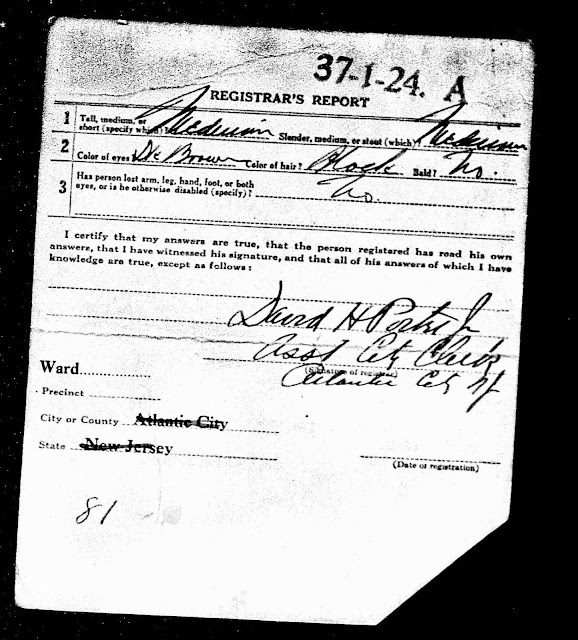 World War I and II Draft Registration Cards I have found to be extremely helpful when trying to locate male ancestors who moved and settled away from their birthplace. Henry C Jones, my 1st cousin 3x removed, was a prime example of this. 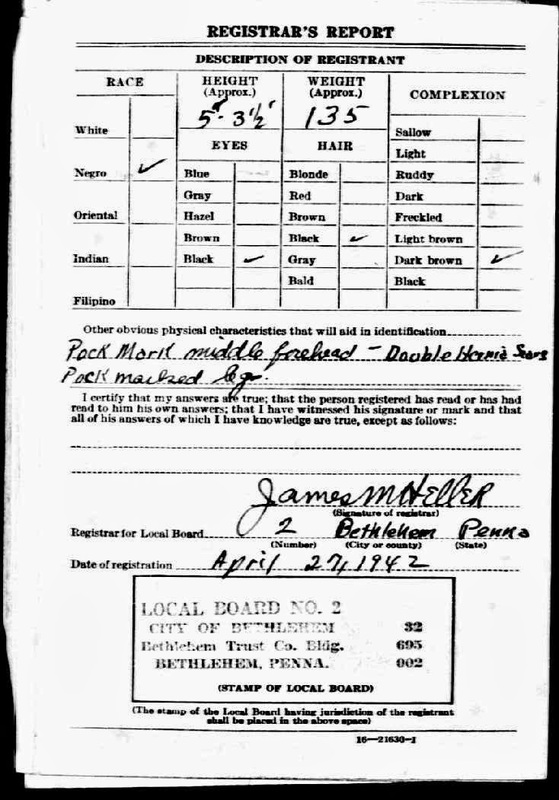 He was another child of William Henry Jones and Emma Shepard Jones of Morehead City, NC. William Henry Jones and my 2nd great grandfather, Alexander Hamilton Jones, were brothers. In this particular case, the last census I could find Henry listed living in Morehead City, NC was for the year 1910. Here he is at 18 years of age shown living with his parents and several of his brothers and sisters. Image courtesy of Ancestry.com: Source Information: Ancestry.com. 1910 United States Federal Census [database on-line]. Provo, UT, USA: Ancestry.com Operations Inc, 2006. When I first started researching my Jones line, I was quick to go searching those individuals that stayed close to home. Why? Because it was easy. It was known. I knew the resources to go to to find out more on those folks. 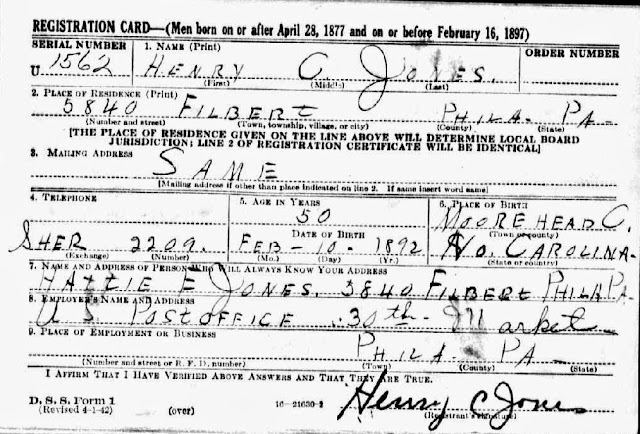 Henry C Jones was one of those who seemed to have disappeared. Could he have moved, but where to? Then one day, and don't ask me what day that was because my memory these days is not as good as it used to be. (Smile) Well one day, I figured out that sometimes less can lead to more. Specifically, I entered his name and birthplace only into the search fields on Ancestry.com and Boom! I learned he had moved to Pennsylvania. Image courtesy of Ancestry.com.Source Information: Ancestry.com. U.S., World War I Draft Registration Cards, 1917-1918 [database on-line]. Provo, UT, USA: Ancestry.com Operations Inc, 2005. Images courtesy of Ancestry.com. Source Information: Ancestry.com. 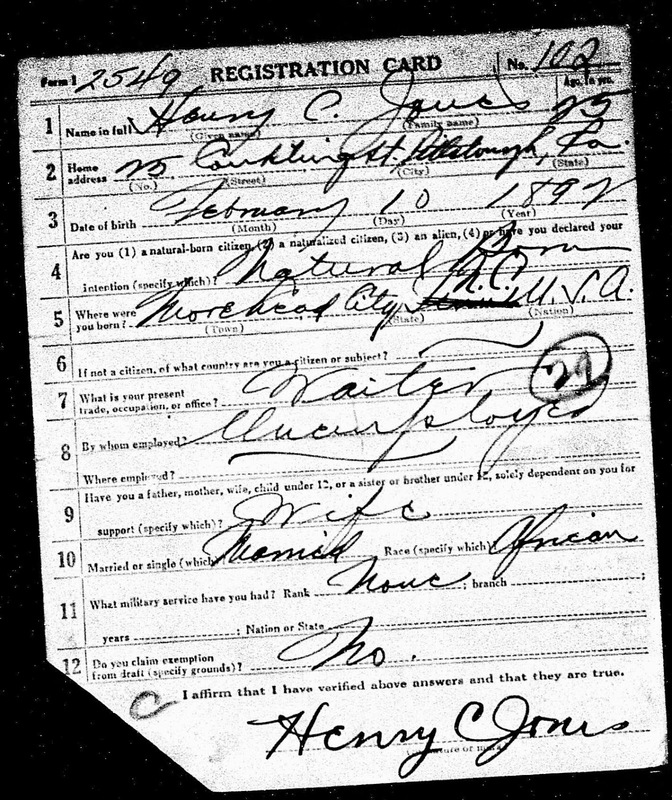 U.S., World War I Draft Registration Cards, 1917-1918 [database on-line]. Provo, UT, USA: Ancestry.com Operations Inc, 2005. Image courtesy of Ancestry.com Source Information: Ancestry.com. 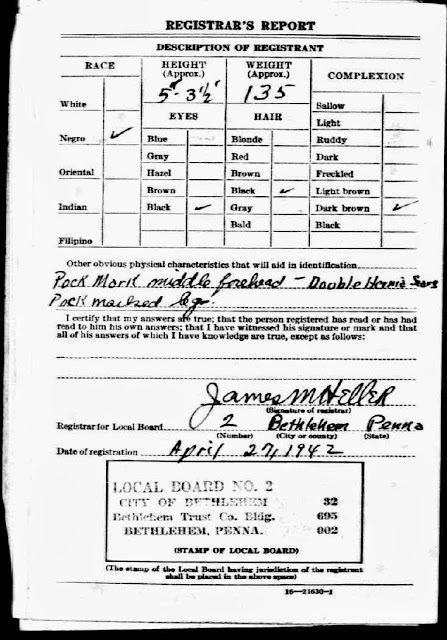 U.S., World War II Draft Registration Cards, 1942 [database on-line]. Provo, UT, USA: Ancestry.com Operations, Inc., 2010. 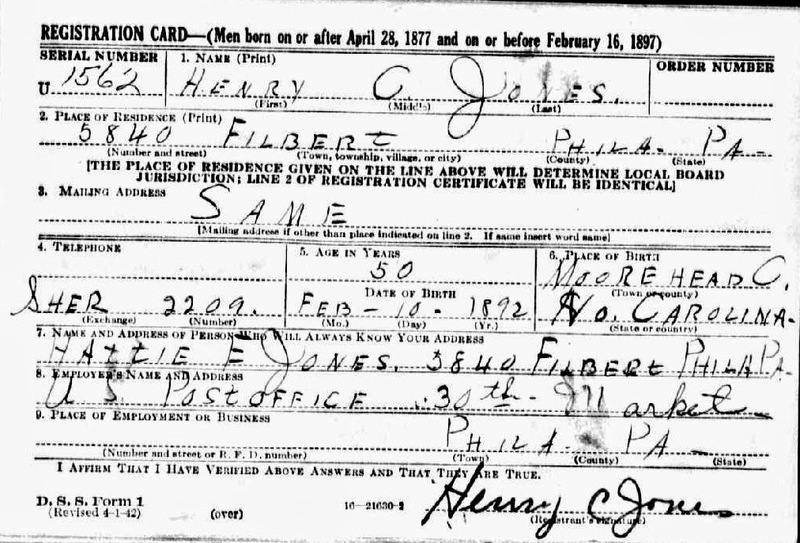 In an upcoming post I will share a little more about Henry C. Jones but for now I am going to take a break because tomorrow is a special day and I have another post to put out about that. P.S. Okay it is now officially tomorrow as I see the time is 12:20am. So I do realize it is Tuesday, but here's Military Monday... so there!